This citrine cocktail ring (pictured above) sparkles alongside glossy artisanal truffles. 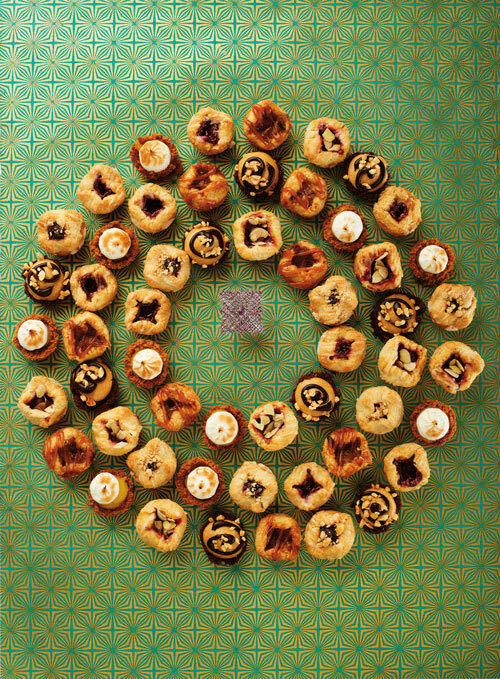 The top and bottom are created with pan-roasted almonds and tart cherry preserves while the sides are California figs with 20-year barrel-aged balsamic vinegar; both covered in rich dark chocolate. Cherry almond truffles and balsamic fig truffles, six for $25, by Forte Chocolates. 28 carat citrine, white and yellow sapphire cocktail ring, $650, by Shiroiy Darius Cama. 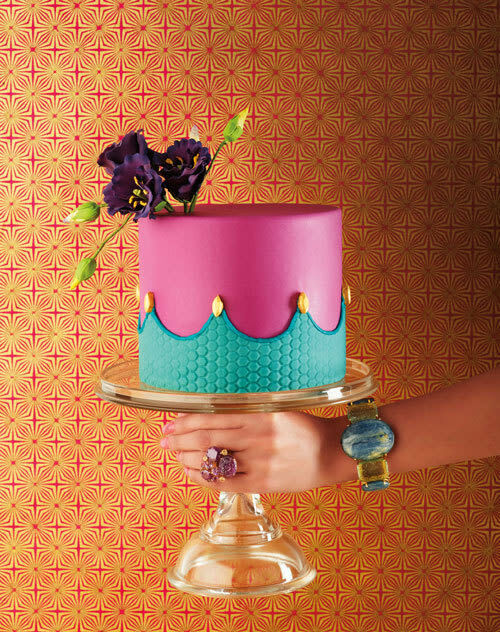 This colorful custom dessert and beautifully ornate jewelry are distinctively quirky. The single-tiered creation has a hexagon-embossed teal scallop trim and edible golden accents, adorned with a cluster of handcrafted sugar lisianthus. The cake is Matcha Plum (green tea sponge cake with mirabelle plum mousseline filling), $15/serving at Honey Crumb Cake Studio. Green onyx and fluorite bracelet, $775, and carved amethyst, ruby and amethyst ring from the Rock Candy Collection, $375, by Bounkit. Decadence hits a new high with this stunning rose gold sapphire bracelet, completely encrusted with gems and a rose gold clasp. 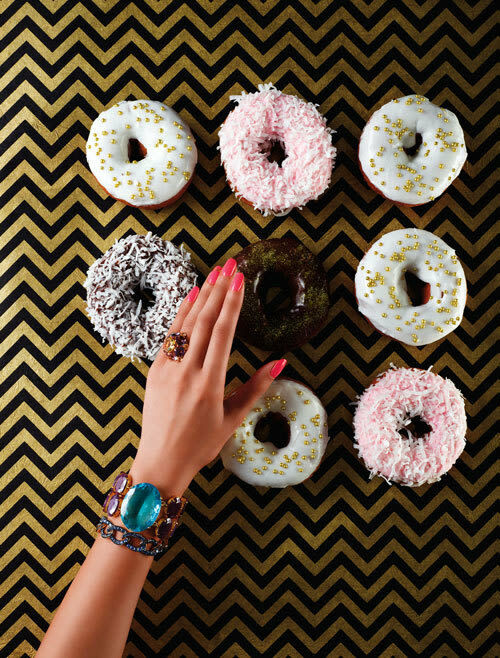 Worn with a candy-colored bangle and caramel-colored rock ring, elegance becomes fun with a spread of glam donuts. Bracelet Tango in rose gold and blue sapphires $36,000 by Pomellato. Citrine crystal ring, $650, by Shiroiy Darius Cama. Aquamarine and amethyst bracelet, $775, by Bounkit. Gold Wedding Dragees, Pink Feather Boa, Chocolate Feather Boa, and Double Trouble Chocolate (with stylist’s own edible gold glitter dusted on) doughnuts by Top Pot Doughnuts, $15/dozen. Get The Look: Kelly O at Juniper Nails in West Seattle gave our model this bright-as-candy coral gel manicure for a modern, autumn bridal look. She says, "I love the metallic bands because it reminds of the stacked midi ring trend, lending to the idea that your nails are an accessory of their own!" This threaded pearl and diamond birdcage necklace brings a little flapper glamour to your big day. 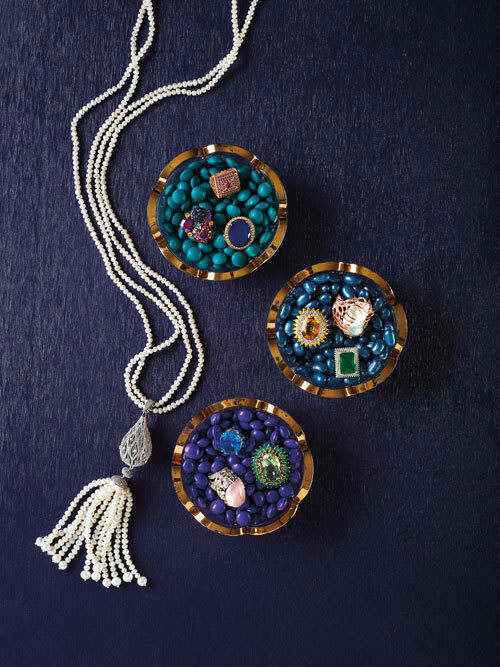 40-inch rope tassel natural pearl and sapphire sautoir necklace, $950 by Shiroiy Darius Cama. Dish 1: Red topaz ring, $310, by Shiroiy Darius Cama. Carved amethyst and ruby ring, $375, and lapis and white topaz ring, $285, by Bounkit. Dish 2: 70-carat Baroque pearl ring, $550, citrine, white and yellow sapphire cocktail ring, $650, jade and white topaz ring, $450, all by Shiroiy Darius Cama. Dish 3: Blue quartz ring, $450, green amethyst, tourmaline and natural emerald ring, $600, rose quartz and white sapphire ring, $650, all by Shiroiy Darius Cama. Teal Milkies ($14.95/lb), Jewel Blueberry Jelly Belly Beans ($11.95/lb), and Purple Milkies ($14.96/lb), by The Confectionery. Nothing goes with bite-size pies better than a stunning ring: a square smattering of pink sapphires sets off this intricate piece. Pink sapphire ring, $550 by Shiroiy Darius Cama. Pie Babies in caramel apple, lemon meringue, peanut butter chocolate mousse, sour cherry, raspberry and marionberry hazelnut, $24/dozen, at A La Mode Pies. Organic Washington huckleberries create this saturated sorbet, perfect for a harvest-time celebration. 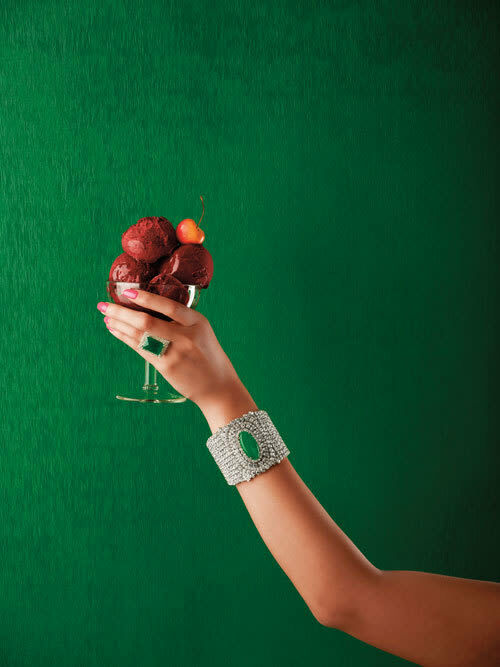 Make sure your toast is as sensational with this jade and white topaz ring, $450 and jade crystal cuff, $1,500, by Shiroiy Darius Cama. Molly Moon’s Huckleberry sorbet (available in fall), price upon request for wedding pints and quarts, Molly Moon's Homemade Ice Cream. Vintage props in this story provided by Home Cake and Aging Fancies.